After directing scripts by Charlie Kaufman for Being John Malkovich and Adaptation and then collaborating with Dave Eggers to write Where the Wild Things Are, Spike Jonze went solo to pen the script for his most recent feature Her and promptly won numerous awards for his effort, including the Oscar for original screenplay. 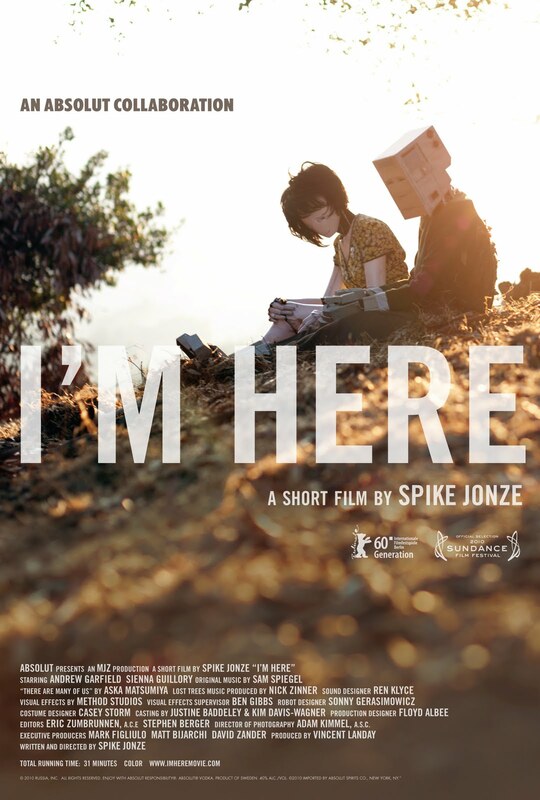 Aside from studying the script for Her, I also recommend checking out this far less known short that Jonze made in 2010, I’m Here, which is a bit of a thematic and stylistic warmup for issues explored in Her. Also, you can check out the links with each movie above for screenwriting perspectives and discussions with Kaufman, Eggers, and Jonze. Besides the clear applications to Chapter 7 of Moving Images (From Page to Screen), I’m Here also prompts topics explored in Chapter 5 — Personal Expression and Studio Production — by provoking questions of “Who made this? / Why did they make it?” and related inquiries. In this case, Jonze, who has worked on music videos and commercials throughout his career, creates here a “commercial” that is 30 minutes instead of 30 seconds. And that is not truly a commercial. Well, it’s really a (long-ish) short funded by Absolut for production studio credit and some cachet, it appears. “Merchants of Cool,” indeed.